The shoes are pretty dark, it must have been the bright sunlight that made them look lighter. Ended up wearing the shoes for several hours walking this weekend and they became much more supple. I've been wearing the Ilkleys with a thin pair of socks under a thicker pair which has helped. I wore them with a single pair of socks a few days ago and was suffering after a while. They are improving though, gradually. Couldn't walk all day in them yet! 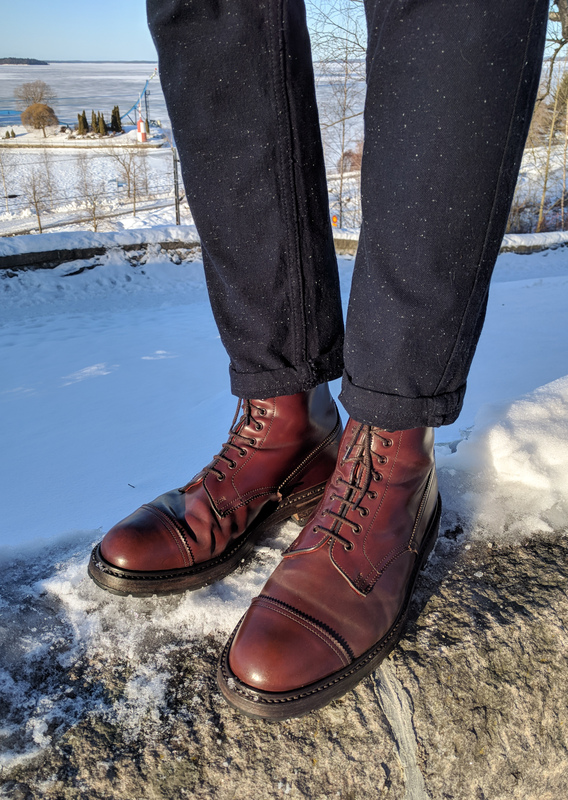 Should have bought the green when I could have ..
Just bought my first pair of Tricker's - the Richard longwings in brown suede, which seem a little narrow on the toe but think I can make work with thin socks. Quick question for you folks - does anyone know why the sides aren't stitched together in the back like in most longwings but the heel is an independent piece stitched onto the sides? I have very little knowledge of shoe construction but it seemed curious when compared to other offerings I've seen from Alden, AE, etc. Thanks v much. Strange. My Kudu Richards aren't like that. Is the outer heel actually a separate piece, or are you seeing the stitches attaching the inner suede heel liner? I believe the model you have is unlined, so the connecting stitches would have to go all the way through the outer. I've seen a number of pairs of Richards that have the stitching on the side like that, and also some that don't. Not clear if it's a material thing (the ones with the side-stitching have been suede and binder leather). Shell, snow and sun. All things good. What UK size are you? If you happen to have a pair in a uk9 you want to sell and nishant doesn’t want them I would be interested. That stitching only appears on the lightweight unlined Richards. The ones with standard construction don't have it.